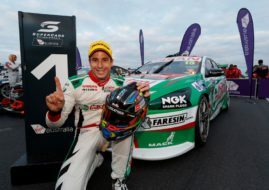 After almost a month between the V8 Supercars races, the drivers and the fans are eager to battle on a well known Australian track – Sydney Motorsport Park. This circuit is longer that the rest of the sprint type tracks and it has 3.9 kilometers in length. Circuit has some difficult corners and a couple of sections where drivers go flat out so the racing here is always interesting. However, before the race weekend has even begun there was one unfortunate incident when James Courtney was injured by pit lane equipment and transported to hospital in stable condition. The incident happened when a helicopter above the pit area caused debris to start flying all over the place. Courtney was hit by a flying object causing two broken ribs. Unfortunately, he will not be able to race this weekend and we hope that he will recover soon. However, second practice session was different and best time (1:29.9026) was achieved by Ford driver, Chaz Mostert who showed that he is fast and skilled and good on sprint type tracks. Second was Tim Slade and third was Shane van Gisbergen. For full results, click HERE and stay tuned for more coverage tomorrow.